Opening in May 2019, the Barbican presents a major new exhibition: AI: More Than Human – an unprecedented survey of creative and scientific developments in Artificial Intelligence, exploring the evolution of the relationship between humans and technology. Part of Life Rewired, the Barbican’s 2019 season exploring what it means to be human when technology is changing everything, AI: More Than Human tells the rapidly developing story of AI, from its extraordinary ancient roots in Japanese Shintoism and Ada Lovelace and Charles Babbage’s early experiments in computing, to AI’s major developmental leaps from the 1940s to the present day to show how an age-old dream of creating intelligence has already become today’s reality. Told through some of the most prominent and cutting-edge research projects, from Deepmind, Jigsaw, Massachusetts Institute of Technology (MIT) Computer Science Artificial Intelligence Laboratory, Sony Computer Science Laboratories and Hiroshi Ishiguro, who famously created a robot version of himself, alongside the artists who are embracing its new possibilities in their work. The exhibition presents new commissions and projects by, artists, researchers and scientists Joy Buolamwini, Stephanie Dinkins, Mario Klingemann, Kode 9, Lawrence Lek, Massive Attack, Lauren McCarthy, Yoichi Ochiai, Neri Oxman, Anna Ridler, Chris Salter, Sam Twidale and Marija Avramovic, and Universal Everything. With digital media, immersive art installations and a chance for visitors to interact directly with exhibits to experience AI’s capabilities first-hand, this festival-style exhibition takes place all over the Centre to examine the subject from multiple, global perspectives and give visitors the tools to decide for themselves how to navigate our evolving world. It will ask the big questions: What does it mean to be human? What is consciousness? Will machines ever outsmart a human? And how can humans and machines work collaboratively? At the heart of the main exhibition in The Curve is the Data Space. This responsive environment invites visitors to experience how AI works through a series of digital interactives that examine its capability to improve commerce, change society and enhance our personal lives, looking at AI’s real-life application and addressing important ethical issues such as bias, control, truth and privacy, through projects by leading figures including scientist and activist Joy Buolamwini. Artist and electronic musician Kode9 presents a newly commissioned sound installation on the golem. A mythical creature from Jewish folklore, the golem has influenced art, literature and film for centuries from Frankenstein to Blade Runner. Kode9’s audio essay adapts and samples from many of these stories of unruly artificial entities to create an eerie starting point to the exhibition. For the first time in the UK, Japanese media artist Yoichi Ochiai presents projects from his research lab, Digital Nature, including a half-real, half-artificial butterfly. Architect, designer and MIT Professor Neri Oxman and members of The Mediated Matter Group present Vespers, a collection of masks exploring what it means to design (with) life. From the relic of the death mask to a contemporary living device, the collection embarks on a journey that begins with an ancient typology and culminates with a novel technology for the design and digital fabrication of adaptive and responsive interfaces. Stephanie Dinkins’s Not The Only One continues her ongoing dialogue around AI and race, gender and aging using dialogue between three generations of black women to create an AI with whom visitors can hold their own conversation. Mario Klingemann’s piece Circuit Training invites visitors to take part in teaching a neural network to create a piece of art. Visitors will first help create the data set by allowing the AI to capture their image, then teach it to select the most interesting imagery. 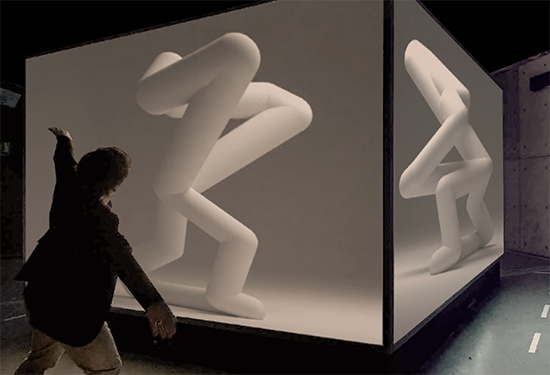 The final projection will be a constantly changing piece of live art. Anna Ridler looks at the politics and process of using large datasets to produce a piece of art, by photographing and tagging thousands of tulips. Sam Twidale and Marija Avramovic explore notions of animism and techno-animism through the lens of Japanese Shinto beliefs, and Lauren McCarthy presents her experiment to become a human smart home intelligence system. A series of new commissions will run across the Barbican’s Level G spaces throughout the exhibition. Digital art and design collective Universal Everything will create a new installation, where visitors can interact with an AI version of themselves and Lawrence Lek’s site-specific open-world video game 2065 invites visitors to play the role of an AI to imagine what life might be like in future years. Chris Salter’s piece Phos (Greek for ‘light’) is a large-scale, dynamic installation that uses sensing and machine learning to inform its patterns, rhythm and behavior. Curated by guest curators Dr Suzanne Livingston and Maholo Uchida, the show is created and produced by Barbican International Enterprises – the Barbican’s touring arm, which creates a dynamic mix of groundbreaking contemporary art and popular culture, architecture, design, fashion and photography exhibitions, taking them all over the world. Previous shows by the team include Into the Unknown: A Journey through Science Fiction (2017), Digital Revolution (2014), which became the Barbican’s most visited show, attracting 93,000 visitors to the Centre and Designing 007: Fifty Years of Bond Style (2012). Co-produced by Groninger Forum, Netherlands, AI: More than Human will embark on an international tour after its run at the Barbican. The exhibition is created and produced by Barbican International Enterprises with guest curators Dr Suzanne Livingston and Maholo Uchida, with support from advisors: Ramon Amaro, Paola Antonelli, Natalia Fuchs, Hiroshi Ishiguro, Kenric McDowell, Murray Shanahan and Anders Sandberg. The exhibition will be designed by Tonkin Liu. Dr Suzanne Livingston has spent her career researching and questioning the entwined relationship between humans, culture and technology and the philosophical consequences emerging from that. Taking a multidisciplinary approach, Suzanne has worked across sectors in technology, arts, museums, education and business markets. As Global Principal at Wolff Olins, Suzanne develops strategy and exhibitions internationally with museum organisations such as the V&A, Whitney, ICA Boston, Qatar Museums and Southbank Centre and also with technology businesses including Sony Worldwide, Playstation and Ericsson. Suzanne received her PhD in Philosophy from Warwick University and is a founding member of the influential Cybernetic Culture Research Unit (CCRU). She continues to write collaboratively on technology, belief systems, innovation and evolution. Maholo Uchida’s curatorial research focuses on the relationships between art and science. As senior curator at Miraikan (National Museum of Emerging Science and Technology), Tokyo, Maholo has developed exhibitions including TIME! TIME! TIME! (2003), a series of collaborations between artists and scientists exploring our relationship to time, as well as LOVE STORIES - Why You Are Not Alone (2005), an investigation into the history of human love. Throughout her career, Maholo has commissioned internationally acclaimed artists including Björk, Ingo Günther and Jeff Mills. She was also a member of the jury for the Prix Ars Electronica in 2013 and has received Masters degrees in Media and Governance from Keio University in Tokyo, and in Scenography from Zurich University of the Arts. Dr Ramon Amaro is a Lecturer in the Department of Visual Cultures and in the Centre for Research Architecture at Goldsmiths, University of London. Previously he was Research Fellow in Digital Culture at Het Nieuwe Instituut in Rotterdam and visiting tutor in Media Theory at the Royal Academy of Art, The Hague, NL (KABK). Ramon completed his PhD in Philosophy, a Masters degree in Sociological Research and a BSe in Mechanical Engineering. He has worked as Assistant Editor for the SAGE open access journal Big Data & Society; quality design engineer for General Motors; and programmes manager for the American Society of Mechanical Engineers. Paola Antonelli is Senior Curator of Architecture and Design and Director of Research and Development at the Museum of Modern Art, New York, where she recently programmed the salon AI - Artificial Imperfection. Paola is curator of the upcoming XXII Triennale di Milano, titled Broken Nature, and has served on several international architecture and design juries. She previously lectured at the University of California, Los Angeles, and taught design history and theory at the Harvard Graduate School of Design and at the School of Visual Arts in New York. Paola trained in Architecture at the Polytechnic of Milan and has also been awarded Honorary Doctorate degrees from the Royal College of Art, Kingston University, London, the Art Center College of Design, Pasadena, and Pratt Institute in New York. Natalia Fuchs is a new media researcher, art historian and international curator. She graduated from the University of Manchester (MA Cultural Management) and from the Danube University (MA Media Art Histories) in Austria. She has founded the art relations practice ARTYPICAL, worked as a curator at the Polytechnic Museum in Moscow and as the deputy director of the National Centre for Contemporary Arts Moscow. Since 2017 Natalia has been teaching Media Art History at the Moscow State University in the World Art History department. Natalia also produces her own AV performances and video artwork, in addition to advising arts institutions. Hiroshi Ishiguro is Professor of Department of Systems Innovation in the Graduate School of Engineering Science at Osaka University, and Director of Hiroshi Ishiguro Laboratories at the Advanced Telecommunications Research Institute. His research interests include distributed sensor systems, interactive robotics, and android science. He has developed many humanoids and androids and has received the ‘Best Humanoid Award’ four times at the RoboCup competition. Kenric McDowell has worked at the intersection of culture and technology for twenty years having worked for R/GA, Nike, Focus Features, HTC Innovation and Google. Kenric currently leads the Artists + Machine Intelligence programme at Google Research, where he facilitates collaboration between Google AI researchers, artists and cultural institutions. He is a regular speaker at conferences and has spoken about art and interdisciplinary collaboration. Murray Shanahan is Professor of Cognitive Robotics at Imperial College London and a Senior Research Scientist at DeepMind. His publications span artificial intelligence, robotics, logic, dynamical systems, computational neuroscience, and philosophy of mind. His book Embodiment and the Inner Life was a significant influence on the film Ex Machina, for which he was a scientific advisor. His following book The Technological Singularity was published in 2015. Anders Sandberg is a senior research fellow at the Future of Humanity Institute at Oxford University and research associate to the Oxford Uehiro Centre for Practical Ethics, and the Oxford Centre for Neuroethics. He is on the advisory boards of multiple organizations and often debates science and ethics in international media. Anders has a background in computer science, neuroscience and medical engineering. He obtained his PhD for work on neural network modelling of human memory.